This will be a brilliant night. We have the best venue ready for you. Drinks at club prices and a huge free car park in a central location accessible to those coming from north, south, east or west. We have a delicious buffet dinner on between 6:30pm and 8:00pm for an extra $20. We have the best entertainment. Legendary kiwi entertainer Shane is famous for his TV appearances and hit records and he is bringing his six- piece band Shazam. 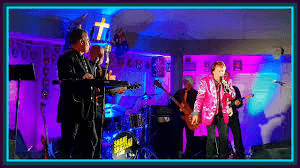 Whether it’s music of the Rolling Stones, the Beatles or classic rock n roll you are guaranteed a fantastic night of music and dancing from the man who certainly knows how to entertain a crowd.